In the common movie of our business reality, most of our energy focuses on winning new customers. We dedicate our sales and marketing efforts to turning prospects into clients and then we replicate it again and again, too many times forgetting about the ones we’ve just acquired. Just like in love building, customer love building takes time and ongoing personalized attention to keep them happy and…loyal. 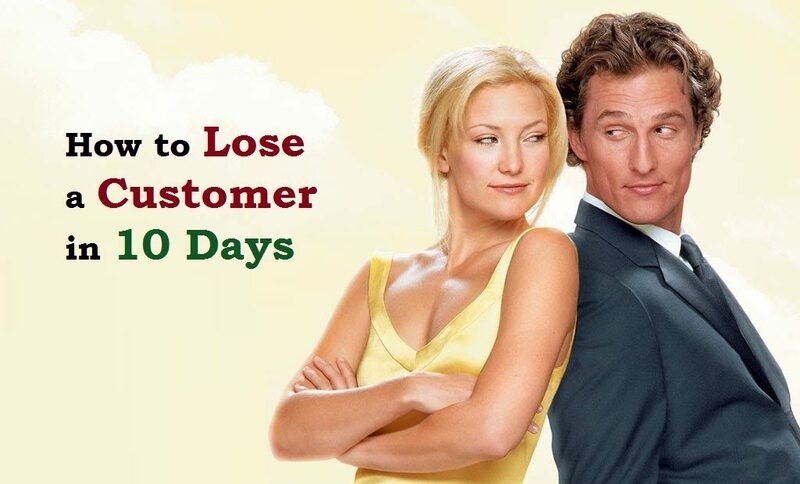 From our experience as both customers on the one side and services providers on the other, we put together a list of ‘how to lose a customer in 10 days’ reasons that we recommend each company to avoid. This drives away your customers and ruins your reputation through an unfavorable word of mouth. It is better to only commit for what you can do best, deliver it flawlessly and then keep on exceeding expectations. Testimonials and case studies are great ways to prove your expertise and successful deliveries. Make sure yours are authentic, well written and they match reality. Your customers would love to pay your invoices with a smile on their face. Upselling is one thing, but trying to make your customers captive so they will pay more than agreed is simply wrong. It may work once if you left them no choice, but be sure they will wait for the closest opportunity to leave and never come back. A pleasant overall attitude based on honesty, openness, and proactivity brings satisfaction to any relationship. Don’t get condescending or self-sufficient even if you’re so good at what you do, because they have many and maybe more pleasant other options. As people are sensitive to the experience they get along their contractual journey, you need to make sure your employees know how to handle sensitive situations or feedbacks, additional requirements or how to just be genuinely helpful. People feel when you care about improving your services and increasing their satisfaction. This feeling builds up through every interaction with your brand, be it through people, products, services or online. So listen, ask open questions and react to any type of feedback with a smile and a set of improvement measures if necessary. Have you ever committed to delivering at a certain date and then failed to do it? Well, we all have at some point. The least we could do in this case is pick up the phone and offer a new deadline and a good reason for the delay. Don’t ignore it as they would never notice. The same applies to timely replies to e-mails or messages on social media. Customers need to feel that there is someone there respecting them and handling their needs, even if not in a perfect way. In time, even the best relationships get rusty without elements of surprise and delight. It could be anything from proactive ideas, special conditions for the most loyal customers, personalized messages or custom services. It will never cross their mind to leave you and will turn into brand ambassadors that will recommend you every time they can. We all avoid people that only call us when they need something and use our friendship as a reason. The same applies to customers when you develop only a ‘sell, sell, sell’ relationship. Think about them as human beings not as nameless means to grow your business. Otherwise, they will start avoiding you and looking for more human companies. Day 10: Share your own! What would be in your opinion to add to our ‘how to lose a customer in 10 days’ list? Share your ideas with us so we can all benefit from them.